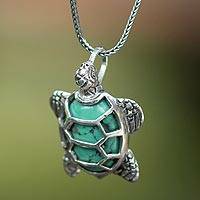 Welcome to Novica's Turquoise Jewelry homepage, featuring unique, handmade turquoise necklaces, earrings and rings. 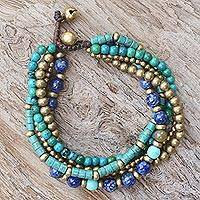 The birthstone of December and a popular stone for jewelry-making throughout history, many cultures believe that turquoise is charged with special properties, primarily healing and spiritual qualities. This has turned out to be the perfect necklace. I love the colors and the lightness of it as it lays on my neck. I am pleased with the type of hasp it has, which is a little "S" shaped hook. Makes it much easier to put on and take off. Thank you for making this necklace. I absolutely adore it. These earrings are incredibly beautiful. The citrine stones are even more beautiful than the online photos convey. They are a nice golden yellow color----not "watery gold." I know I will wear this jewelry a lot! 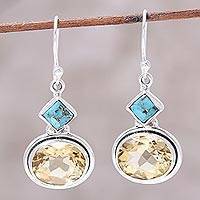 The citrine and turquoise stones complement each other beautifully! Handcrafted Modern Fine Silver and Natural Turquoise Earring, "Eye of the Sea"
Fair Trade Taxco Silver and Turquoise Earrings, "Taxco at Dusk"
Nine-Carat Citrine and Composite Turquoise Earrings, "Watery Gold"
Turquoise has remained at the height of fashion since ancient times; it is one of the oldest-known and most prized gemstones. 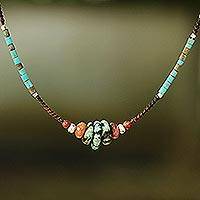 Turquoise adorned the rulers of ancient Egypt, Persia, Mesopotamia and the Indus Valley, and was favored by many Native American cultures. 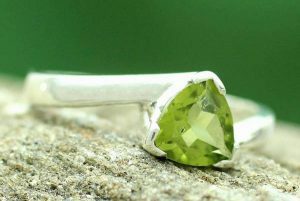 It was also amongst the first gems to be mined, and some historic mines are still working today. In Mexico, the Aztecs inlaid turquoise together with gold and other precious gems to create admirable masks, knives and shields. Oscar Figueroa preserves this legacy with his original turquoise bracelet designs, set in sterling silver. 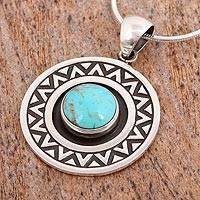 Natural turquoise is not readily available throughout the world, yet talented jewelers and silversmiths remain undeterred; they continue creating original designs with reconstituted turquoise. Indonesian designers such as Agung Pribadi create highly detailed reconstituted turquoise rings, whereas Thai designers like Sasina focus on trendy minimalism with reconstituted turquoise earrings. Turquoise is the birthstone gem for Sagittarius, its birth month is December, and it's the anniversary gem for the 5th year of marriage. 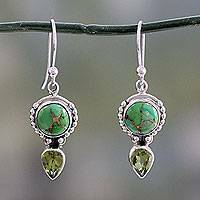 It is regarded as a highly protective stone, and when given as a gift, turquoise is believed to bestow wealth and happiness upon the receiver.